Accompanied by Sri Lanka’s deputy foreign minister, Mr. Dharmapriya Gamage, and the Japanese ambassador in Colombo, Mr.Serichiro Otsuka, Mr. Yano arrived at the Palaly base of the Sri Lanka Army in the morning and immediately held discussions with the acting Jaffna SLA commander, Major General Parami Kulathunga, sources said. The IDPs at the Inuvil camp made a plea to Mr.Yano to help them to resettle in their own lands. They told the Japanese Minister that the camps where they live now are in a dilapidated state and they will suffer when the rainy season starts, civil sources in Jaffna said. Mr.Yano reportedly replied to the IDPs that resettlement in lands which come under High Security Zones would be possible only after a permanent solution is found to the conflict. However, he promised to assist the displaced people in repairing the existing refugee camps before the rainy season starts, civil sources said. During his discussions with the visiting Japanese Minister, Major General Kulathunga said that the SLA had removed seven times more land mines and anti-personnel mines from Jaffna than other de- mining agencies. However he told Mr.Yano that it would take another four years to declare Jaffna a mine free area, sources said. Mr.Yano agreed with the SLA officials that modern equipment is needed to de-mine Jaffna effectively and quickly, sources said. Later, Mr.Yano visited the Duraiappah Maha Vidiyalyam in Jaffna-Colombagam where he handed over an X-ray machine to the UNICEF representative. According to Mr. Yano, Japan will continue to extend its immediate humanitarian assistance in the North and East, in line with international community’s wishes, sources said. “It is my pleasure to announce that Japan has decided to extend approximately US $ 2.6 million to the UNICEF for the improvement of maternal and child health care as a part of such assistance,” announced Mr. Yano before returning to Colombo, sources said. 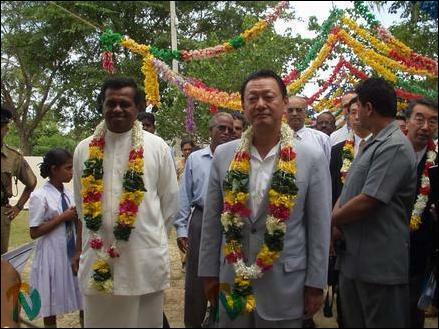 Japanese senior vice foreign minister Mr.Yano arrives at Colombagam Duraiappah Maha Vidialayam with Sri Lanka's deputy foreign minister Dharmapriya Gamage.